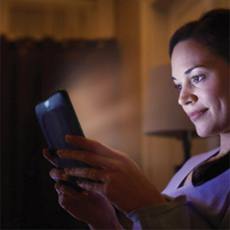 Barnes & Noble has introduced the new NOOK Simple Touch™ with GlowLight™, the world’s first E Ink device with patent-pending lighting technology that eliminates the number-one problem roommates and couples have in bed – having their sleep interrupted, or being prevented from falling asleep, when their partner reads with the light on. With a soft, adjustable glow, GlowLight gives bedtime readers just the right amount of light for reading, without disturbing a sleepy roommate. Like having two Readers in one, the first and only Reader designed to let E Ink customers read in the dark is equally amazing at the beach, with a paper-like reading experience, even in the bright sun. This revolutionary device is the first to combine the most advanced and fastest E Ink display with a precise infrared touchscreen, built-in anti-glare screen for reading in any lit environment, and an evenly distributed and adjustable light for reading in the dark. NOOK Simple Touch with GlowLight is also the lightest NOOK ever, with a long-lasting battery for over one month of reading on a single charge with the light on for just $139. The highly anticipated NOOK Simple Touch with GlowLight has already begun shipping ahead of schedule to customers who pre-ordered the device online through www.nook.com. Customers can also pre-order the newest addition to the award-winning NOOK portfolio in Barnes & Noble College bookstores beginning mid-May. NOOK Simple Touch with GlowLight is the perfect gift for Mother’s Day, Father’s Day, graduations and summer reading. Barnes & Noble offers Always Free NOOK Support in all of its bookstores, with more than 40,000 NOOKsellers across the country ready to assist customers with setting up their NOOK devices or choosing their next great read. For more information on the latest NOOK reading device, visit www.nook.com.